Why have a nail treatment at Therapy House? The first records of nail polish being used date back to China 3,000 years BC. Since then, nail treatments such as manicures and pedicures have never fallen from fashion, and are certainly popular here at Therapy House. We offer a wide choice of nail treatments, all of which are designed to make your hands and feet look incredible and reflect your individual style. Men love our manicures and pedicures too, and many now choose to have nail treatments to keep their nails looking strong, healthy and well groomed. We use Guinot products to nourish, moisturise and rejuvenate the skin on your hands and/or feet. Mani-Q gel polish is a soft gel overlay for natural nails designed to give them strength, shine and to promote healthy natural nail growth. The gel will soak off easily with acetone when it needs to be removed. With OPI, we can treat your nails with the Gel Break nail protector system before applying the gel nail polish of your choice. Caption Polish dries three times faster than traditional nail polish without a UV light, wears with the durability of gel polish, and can be removed without soaking. With a Jessica nail treatment, we use her exclusive range of basecoats and treatments to customise your manicure or pedicure to your individual needs. There are over 200 nourish, vibrant colours to choose from, all of which are free from formaldehyde, Toluene and DRP. We use Caption Polish or Jessica nail products with all file and polish treatments. GELeration by Jessica gives your nails a long-lasting, flawless finish that dries in seconds and protects the nail for up to three weeks. GELeration paints like polish but has the strength and lasting power of gel. Your nails will be protected without chipping, fading or the need for touch ups. This is the perfect on-going solution if you need a hard-wearing polish or you want to help your problem nails grow. 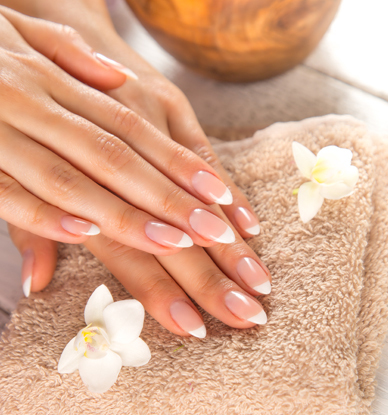 Want to know more about nail treatments?